You are here: Home / Fun in the house / The boys are sharing a room at last! Time to redecorate! The boys are sharing a room at last! Time to redecorate! We just moved Noah into James’ bedroom, so now the boys share a room! I’ve mentioned before that we live in a small flat, and moving Noah into the boys’ room means we suddenly have more living space. And we consider that to be a good deal – now we aren’t creeping around at night so much, although Noah somehow still ends up in our bed, anyway… that’s another story. So, to celebrate this fact – it is a bit of a momentous thing – I decided to redecorate their room. James’ bedroom has never had a theme. We started out with an under the sea idea, then found really great jungle wall decals, so I bought storage to match. Then I found a great transport-themed lampshade in a sale… yeah, it’s a real mish-mash and it would be so great to have a lovely space that they can share and enjoy. Not wishing to abandon the jungle storage, a weather theme would be a good idea, because it’s colourful and bright, while still fitting with the solutions we have for tidying toys. Weather is a really common theme for nursery ideas, and it’s something that will grow with the child well into the preschool years. I’ve picked some pieces that will pop some colour and bring the room together in a theme both boys can enjoy. We have a IKEA Kura bed, with James up top and Noah’s toddler bed underneath. 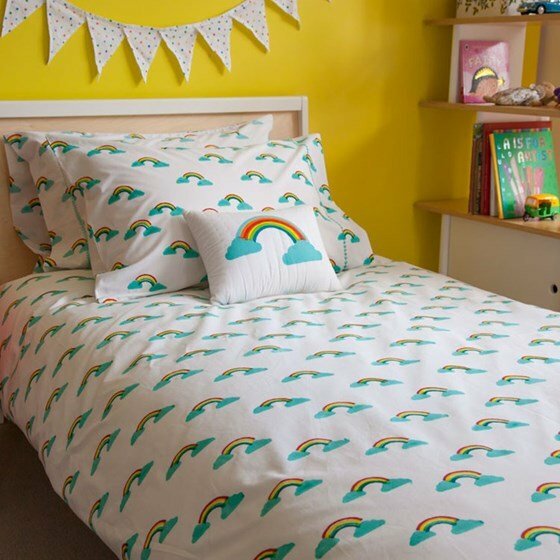 This duvet cover comes in sizes to fit both mattresses, and is super-soft high quality 100% Indian cotton with a lovely hand block printed rainbow motif by Lulu and Nat (use code FOOTE for 10% discount). This cloud shelf with hooks is so cute and yet provides much needed storage in the boys’ small room. The other two shelves are wall stickers by Limmaland to fit with IKEA picture shelves, and equally as effective, I think. The walls of the boy’s bedroom were painted in August, but they are magnolia. I love yellow, and agree with German poet Johann Wolfgang von Goethe, who considered it to be the colour of a gently hopeful attitude to life, however I think a blue would fit better. Cool blues and greens have a restful effect, calming the body and mind and assisting to promote sleep. James’ bed is currently a safe haven for cushions; all the pillows in the house seem to gravitate to it, so this cloud by IKEA would be very welcome there! I don’t think you could have a weather themed children’s bedroom without a bit of felt and rainbow drops, and this is such a great priced piece by 1 little H via Etsy. The colour of the acrylic brings to mind sea glass in this cute mobile by Whitley Bay artists Boo Boo & Ted. For many more of my ideas for updating the boys’ bedroom, check out my Pinterest board.